Is it too EARLY?. . 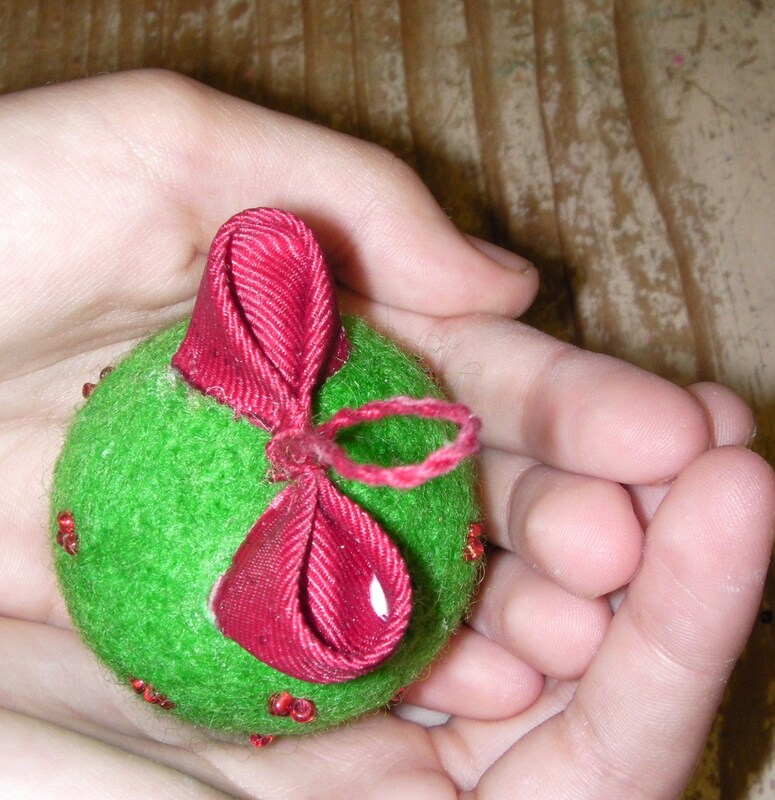 .A Felted Christmas Ornament. Is it too early for Christmas ornaments??? No! I’m right on time. Anyone out there, making homemade gifts and decorations for Christmas knows that you should have already started masterminding the process. With that said . . . 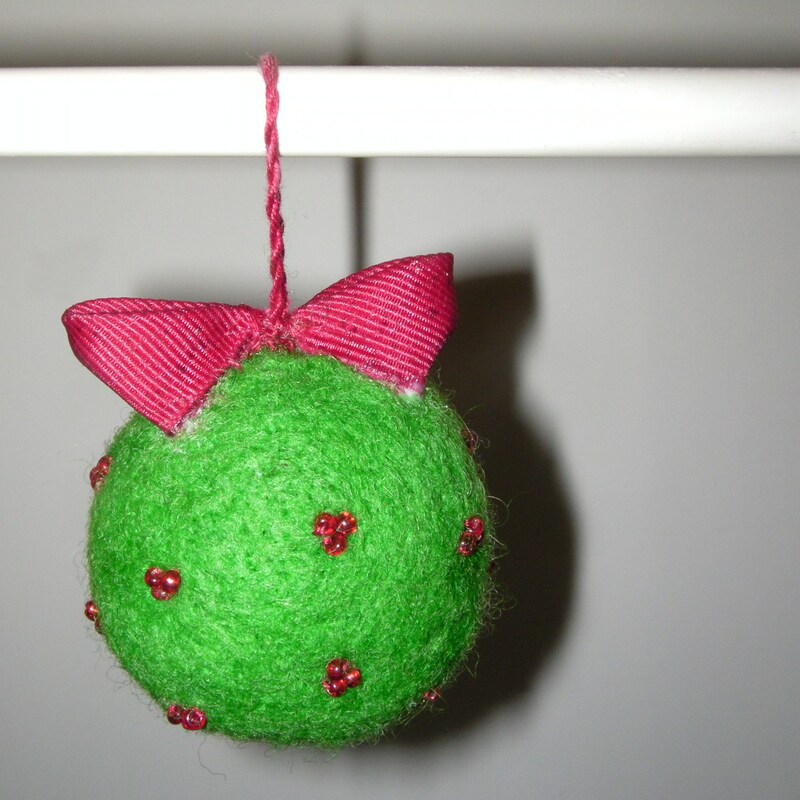 I will share with you my first little Christmas decoration of the year and of course it’s needle felted! It’s the typical red and green; well one of my ornaments had to be, so I started it off with the tried and true. 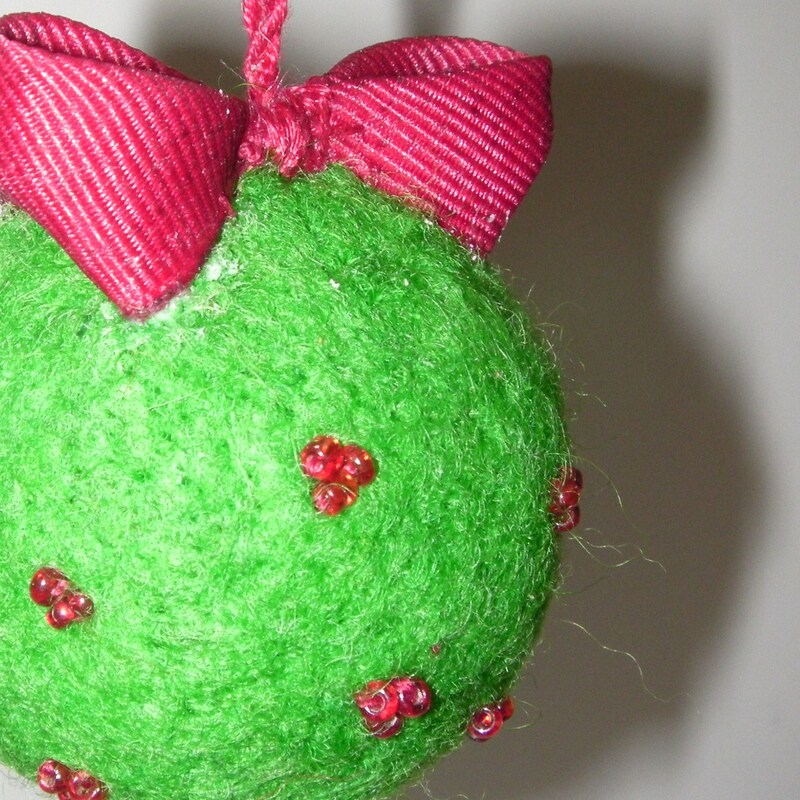 A green ball with red sparkling decorations and a neat little bow at the top. I sewed the bow on and then glued it for extra reinforcement. I was so excited that I didn’t even wait for the glue to dry to snap a photo! Making Christmas ornamnents for my families’ tree was my first real introduction to crafts of any kind. I worked hard at it as a child and soon the tree was covered with ornaments that I handcrafted. And this was no easy task being I was one of four children! This, however, is my first needle felted ornament. But it will not be the last; I just love the idea of these, they are pretty and nonbreakable. Perfect for the lowest boughs of the tree where little ones tend to gravitate. The glass, delicate ornaments at the top out of harm’s way, and the soft ornaments safely on the bottom. I have all kinds of ideas in the works, so expect more ornaments to show up in the next couple of months. If you carefully perused the photos, you would see that I was not lying about the glue thing! NO worries, it dries clear!!! When I complete a few more, I will include this one in the pictures so that you can see it completely dry. Also, you can see that I was not afraid to let my crazy kids hold it; “It’s okay that you dropped it, threw it, stepped on it! I’m not mad. Really! !” Now, get out there and make some ornaments, at least find some really cute ones available for purchase!